Super Saturday Hit-A-Thon is right around the corner! Hit-A-Thon schedule coming soon! 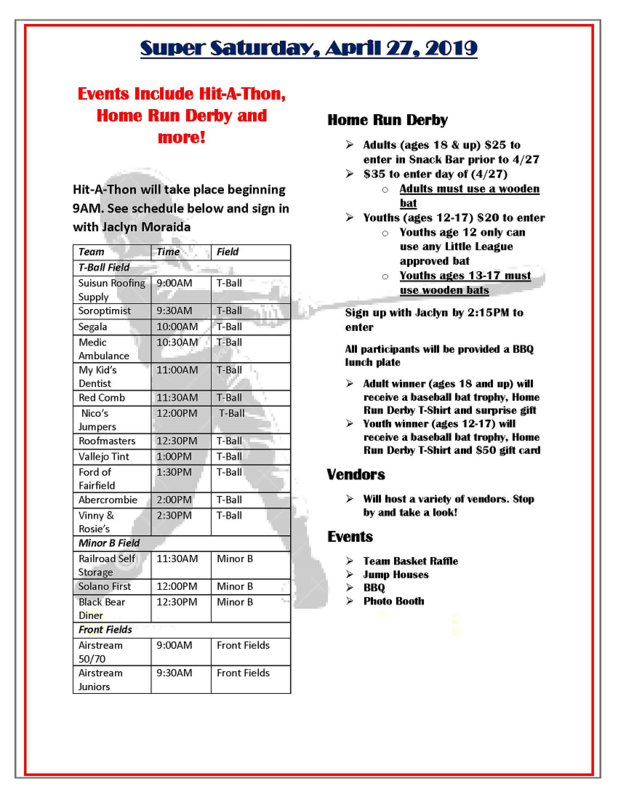 The Suisun American Little League will be hosting a Hit-A-Thon Fundraiser. Please Join us and watch our Players show off their hitting skills and raise money for our League at The S.A.L.L. Fields. Please Pledge a baseball player to help raise money for equipment and field maintenance, facility upgrades and improvements and much more! You can pledge by hit or a flat rate. Then come and cheer on your favorite S.A.L.L. Players. One Player from each division with the furthest ball hit will be rewarded with a prize. There will also be Prizes awarded to the top 3 fundraisers. Thank you for your support!!! If you will be on the field, in the snack bar or around any players in any volunteer aspect you MUST complete the Heads Up Concussion Training. This requirement needs to be done each year prior to volunteering. Please go to https://headsup.cdc.gov/. Once you have completed the training, please print a copy of your certificate. Please email Suisun American Little League at suisunlittleleague@gmail.com if you are interested in becoming a Suisun American Little League sponsor or download and mail back the following sponsorship form.